This is a beginning. I’m carrying large rolls of photographs and carefully packed images and DVDs: objects all part of an exhibition we’ve been trying to pull off in Cairo since last year. The exhibition came as the result of an invitation from Mia Jankowicz at the Contemporary Image Collective – a primarily photographic space for exhibitions and workshops in downtown Cairo. Mia had been approached to do a show of photography and other media which might include the work of South African artists and so she asked me to do some brainstorming about some possible themes – neither of us wishing to make anything that would amount to a geographic survey show. 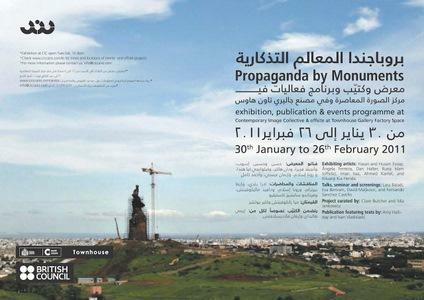 And so ‘Propaganda by Monuments’ as a concept was born. Taking its cue from the short story by Ivan Vladislavic written during South Africa’s tumultuous turn of apartheid to democracy the story offers a fictional correspondence between an opportunistic South African businessman and a translator working for a department of the former Soviet Union. The businessman is looking for a partner in the export/import scheme of the century – a monumental transport of removed Lenin statues to South Africa for re-fashioning as the country’s new heroes (a bit smaller to allow for eyes and ears of course!) Satirical humour aside, the story has become something of a pedestal for me – supporting or rather framing the work of so many contemporary artists working and thinking about their immediate conditions in a post-something context (be it -colonial, -communist, -agrarian, -secular, -political, -modern). Continuar a ler "Clare Butcher's Cairo Dairy: Exhibitions by Increments"